How can we compare the cost, performance and value-for-money of alternative large-scale clean energy projects? Actually, it’s pretty tough to try and avoid apples-and-oranges comparisons. Still, some adjustments can be made, such as for capacity factor, to partially levelise comparisons. Below is a simplified comparison of four recent real-world projects. All can be considered first-of-a-kind installations, except for the wind farm. 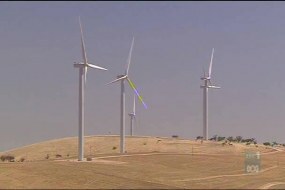 The wind project will use 180 of the 3.4 MWe Suzlon turbines and “generate enough electricity to power 225,000 homes“. It includes a biomass plant that could produce up to 120 MWe of backup power to cover low-wind periods, and might offset up to 2.5 million tonnes of CO2 per year. At average 8m/s winds the capacity factor is estimated to be about 35%. A 60 km undersea high voltage direct current cable will connect it with Adelaide. Cost is $1.3 billion for the generating infrastructure and $0.2 billion for the cable. The in(famous) Olkiluoto 3 NP unit, a European Pressurised Reactor (EPR) being built by the French (AREVA). The project has seen significant delays (first electricity now expected in 2014), and a cost blowout from the original € 3.7 billion to a new figure of € 6.4 billion. Despite this, the Fins have ordered two more EPR units. Assume it runs at the average Finnish capacity factor of 86%. 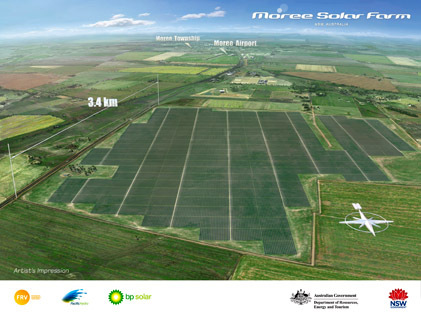 To be built in Moree, this will cover 3.4 km squared with 645,000 multi-crystalline PV panels, and is forecast to output 404 GWh per year (enough for 45,000 households). Part of the “Solar Flagships” programme, the cost is $A 923 million. Estimated to abate 364,000 tonnes of CO2 per year (based on NSW emission factor 0f 0.9 tCO2/MWh). Estimated capacity factor is 30.7% (based on peak power and GWh forecasts) — this seems high compared to typical PV performance.